This paper started while we were synthesising data for general biodiversity-ecosystem functioning relationships at the National Center for Ecological Analysis and Synthesis in Santa Barbara, USA. We realised that much data from the marine side was missing, as many of those studies did not fit the inclusion criteria set up for our original database. Previous meta-analyses1, 2 focused solely on how richness influences resource capture and/or the production of biomass. Marine studies, however, all over the map in terms of what functions they measured: resource use, biomass production, nutrient fluxes, trophic cascades, and so on. Panel with a sessile invertebrate community. Photo credit: Jarrett Byrnes. So what’s the full picture of how biodiversity-ecosystem influences functions in the ocean – from primary production to biogeochemical cycles? 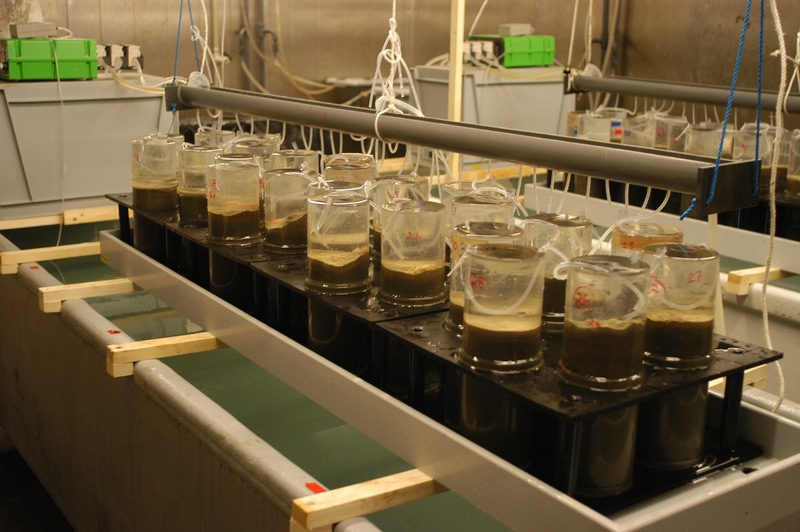 We got our hands on 110 marine experiments that manipulated the number of species and analysed some ecosystem response. In general, our analyses generally confirm previous findings that the average mix of species uses resources more efficiently and produces more biomass than the average monoculture. We honestly weren’t sure how this was going to fall out, and find great comfort in the generality of the result. Soft sediment microcosms, Sweden. Photo credit: Karl Norling. We also identify several gaps in our understanding of marine biodiversity and ecosystem functioning that are ripe for future investigation. First, the number of studies focusing on biogeochemical fluxes is still tiny. We need more. Second, we need more studies in pelagic and salt-marsh environments. Third, we still have only a handful of studies focused on predators. Fourth, the effects of increases in species richness (e.g. due to invasives or range shifts) are poorly understood. And last, we really only looked at relatively simple experiments, using on average only 3 species! We sorely need experiments targeting how spatial scale and heterogeneity, realistic local extinction scenarios from natural (read: large!) species pools, and functional and phylogenetic composition alter the relationship between biodiversity and ecosystem function. To sum: there’s much work to be done, and we look forward with high hopes to the next generation of experiments exploring the consequences of changes in marine biodiversity. 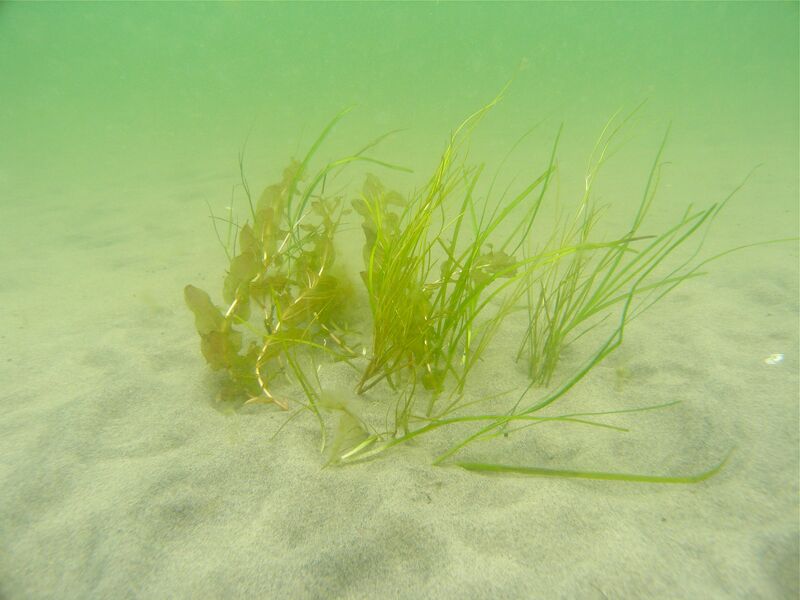 A seagrass field experiment in Finland. Photo shows a polyculture with three species. Photo credit: Camilla Gustafsson. Now, if you had to explain this study to your mom or dad: the world has an incredible number and variety of different species, but we are losing them due to things like overfishing, habitat destruction, and other threats from humanity. We need to understand what the consequences of these extinctions are for healthy and productive ecosystems, which is why researchers conduct experiments where they remove species and see what happens. We summarized data from 110 such experiments and found that losing species, on average, decreases productivity and growth, as well as a myriad of other processes related to how marine organisms capture and utilize resources, like nutrients. These processes ultimately put food on the dinner table and give us clean water. What is most interesting is we expected these declines to be non-linear based on previous studies: you can lose some species up to a point, then it starts to go downhill. The results from our analysis suggest that, for some processes, every species matters! Thus it is imperative that we protect and conserve biodiversity in our world’s oceans. Cardinale, B. J. et al. 2006. Effects of biodiversity on the functioning of trophic groups and ecosystems. – Nature 443: 989-992. Cardinale, B. J. et al. 2011. The functional role of producer diversity in ecosystems. – American Journal of Botany 98: 572-592. Griffin, J., de la Haye, K., Hawkins, S., Thompson, R. and Jenkins, S. 2008. Predator diversity effects and ecosystem functioning: density modifies the effect of resource partitioning. – Ecology 89: 298-305.